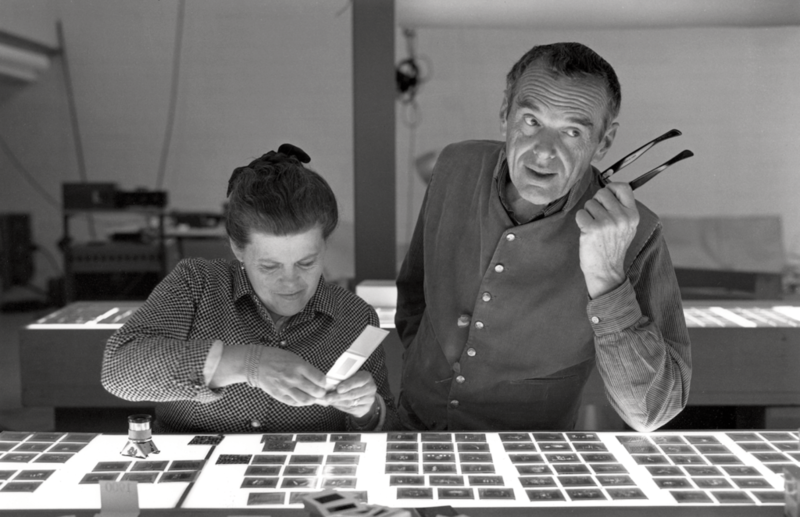 Charles and Ray Eames were design visionaries. 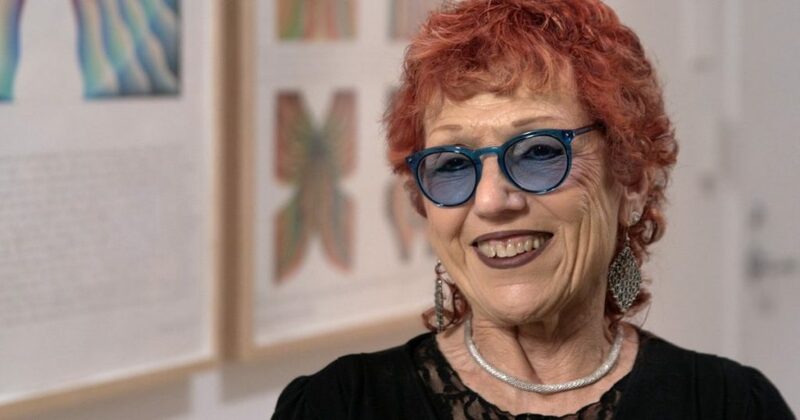 Creating architecture, furniture, graphics, and multimedia from the 1940s through the 1970s, the couple pioneered the playful, multidisciplinary, and user-centered approach that has come to define California design. 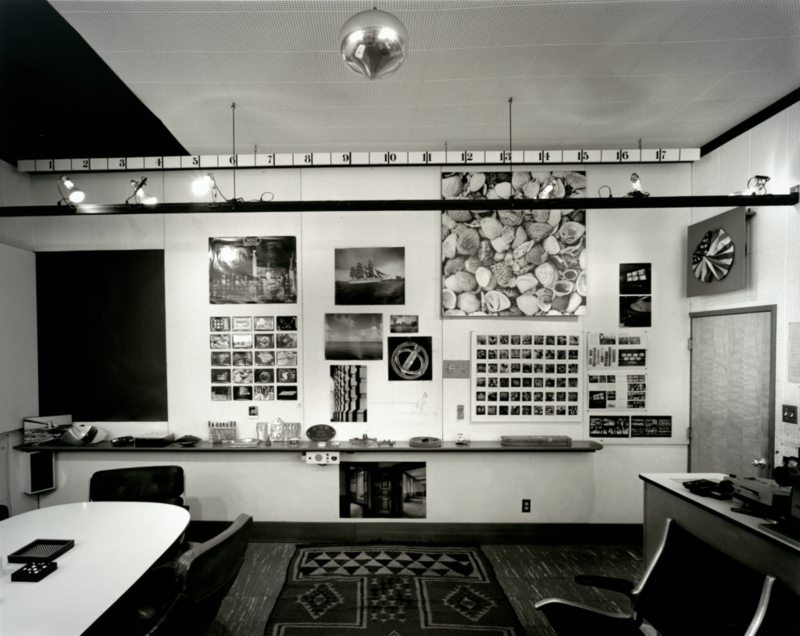 In 1989, SFMOMA acquired the entire contents of the conference room from the Eames Office, which they occupied for over 45 years. 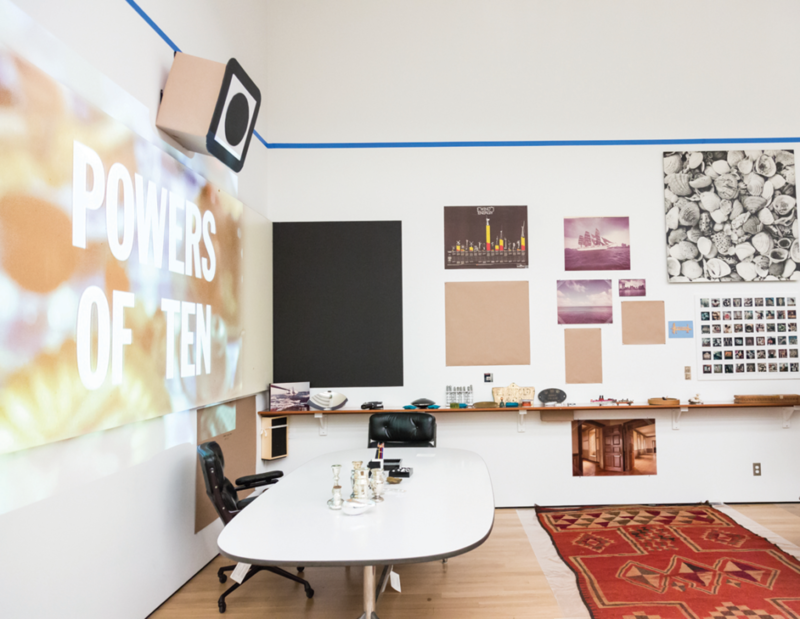 A mix of collectibles and seemingly mundane audio-video equipment, the conference room is an incredible artifact of a less well-known aspect of the Eameses’ work — an effort to leverage design and technology to promote communication, share knowledge, and inspire creative producers. In preparation for the exhibition Designed in California, we are revisiting the Eames Office Conference Room as part of a larger exploration of how California designers have significantly transformed the way we work and live. The Eameses are widely recognized for their early experiments in plywood furniture and the design of their own home, constructed from prefabricated materials as part of the iconic Case Study House Program. The couple were design magpies, juxtaposing the latest in modernist tools with craft, folklore, and details of daily life drawn from their travels around the world. These interests are clear in the conference room, where wooden toy tops, shiny Mexican milagros, and wallpapered switch plates are drawn together in a reflection of the couple’s exuberant curiosity. However, the Eameses also worked at the cutting edge of a burgeoning technological landscape. They collaborated for decades with technology giant IBM to produce exhibitions, films, and graphics that educated the masses about the then-new computer. Through this work, they became sought after for their skill in making technology humane, exciting, and accessible. Recognizing these information environments as projects the Eameses approached with the same sensibility and drive as their architecture and furniture provides a richer understanding of their unique design practice. 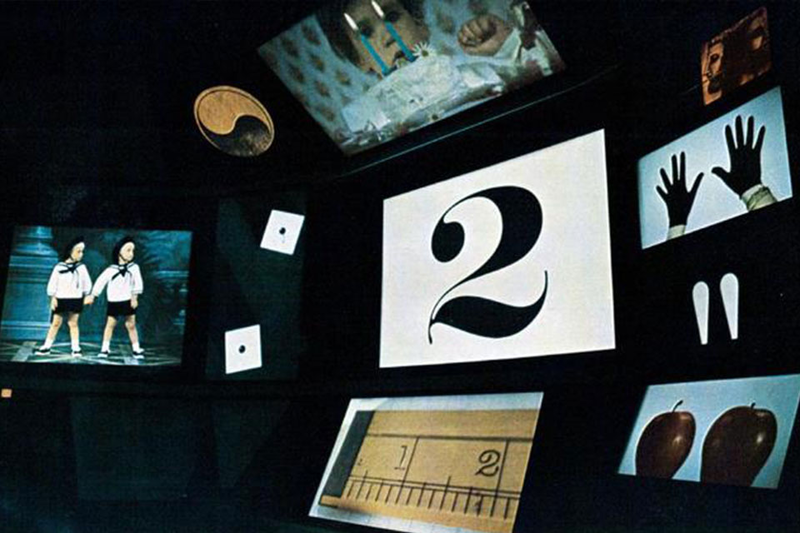 As Charles Eames stated, “Whether it’s a house or film or chair — it must have a structural concept.” The Eameses’ films and projection presentations translated their analog juxtaposition of objects, images, and ideas into the realm of media and technology. One of the studio’s most ambitious multimedia projects was Think, a 22-screen presentation created for the IBM pavilion at the 1964–65 New York World’s Fair. Immersing viewers in a kaleidoscopic mix of photographs, film clips, and narration, Think outlined the shared dynamics of human and computer communication and problem solving. The Eames Conference Room will be on view in Designed in California, through May 27, 2018 on Floor 6. Robert J. Kett is a curator, writer, and researcher based in San Francisco. 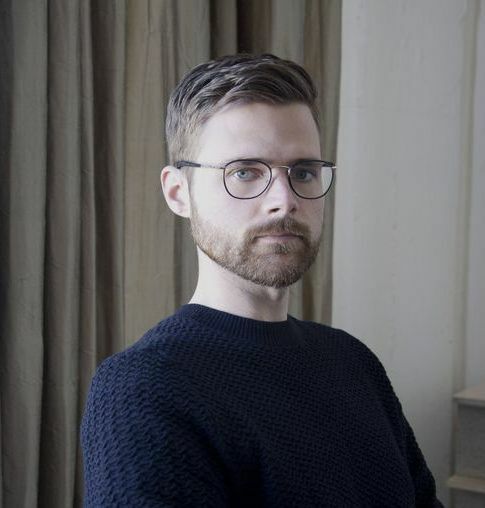 He is currently a Curatorial Assistant in the Architecture + Design department at SFMOMA and emerging curator at the Centre Canadien d'Architecture. He received his PhD in the anthropologies of science, technology, and material culture from the University of California, Irvine and has held previous positions at the Max Planck Institute for the History of Science and the Getty Research Institute. His writing has been published in Representations, Design Observer Quarterly, the Getty Research Journal, and elsewhere and he was a coeditor of Learning by Doing at the Farm: Craft, Science, and Counterculture in Modern California. (Soberscove, 2014). 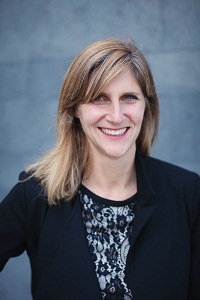 Jennifer Dunlop Fletcher is the Helen Hilton Raiser Curator of Architecture and Design at SFMOMA.